Have you received positive commentary on Twitter regarding your products, service, event, training course etc.? Why not embed the tweet and place on your website. Be creative and stand out from the crowd. 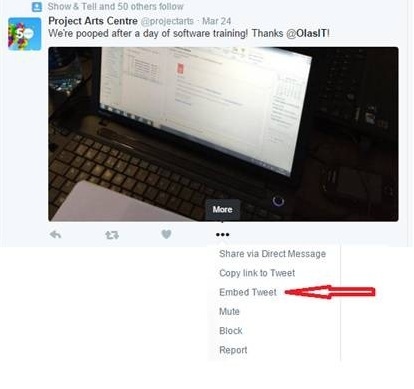 The embedded tweet can look well in the Testimonials section of your website, or help to sell your next training course, promote your next event etc. It’s easy to do: just click “More” under the relevant tweet, select “Embed Tweet” and copy and paste the code onto your website.